Does your family have a disaster kit? 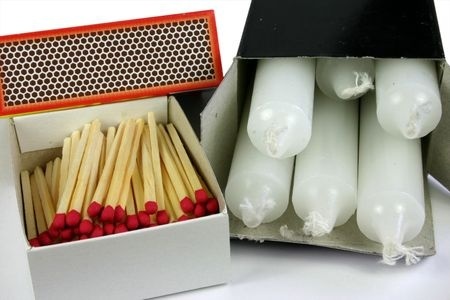 Candles and matches are an essential component of any disaster survival kit. While they may never happen to you, fires, floods, earthquakes, tornadoes, hurricanes and other catastrophes strike millions of households each year. So it's only prudent to prepare for them. Assembling a disaster kit should be a top priority. Your kit should contain enough supplies to see your family through at least three days without basic services. While you can buy emergency kits, it's simpler and less expensive to create your own. Here are the essentials to include when creating your disaster planning kit. Start with a few basics: drinking water (about 1/2 galling [approximately 2L] per person daily), canned or dried food, can opener, gas stove, current family photos (to help find family members who are missing), flashlights and radio with spare batteries, lantern, heavy-duty work gloves, candles, matches, and first aid kit. In addition, you should include flares or an alarm to summon emergency crews, a personal commode with sanitary bags, a tarp, and several sturdy plastic lawn-and-leaf bags. A crowbar and shovel are useful if you need to work your way to a family member trapped by fallen objects. A hammer and nails will help secure your home's doors and windows if you must evacuate. In addition, you should stash enough cash to see you through several days, as banks and automated teller machines may be shut down. If you have an infant, stock up on formula, diapers, and baby wipes. And if a family member requires medication, make sure you have an up-to-date supply on hand. Don't forget food, water, and a leash or cage for pets. Store these supplies in a duffel bag or backpack that you can easily carry should you have to evacuate. Keep all items that don't fit in the bag, such as water containers, in a place where they're easy to reach in a hurry. To the top of the kit, tape a "Don't Forget" list of last-minute items to take; such items might include an extra pair of glasses or contact lenses, your address book, and important family documents, and keepsakes. Keep these documents in a waterproof, portable container: wills, insurance policies, contracts, deeds, stocks and bonds certificates, passports, social security cards, immunization records, bank account numbers, credit card numbers and company contact information. If you smell gas after an emergency, turn off the gas at the main shutoff valve next to your gas meter. Use a wrench to give the valve a quarter turn clockwise or counterclockwise; when the tang (the part you put the wrench on) is perpendicular to the pipe, the valve is closed. Plan for the worst case scenario. In the best case scenario, all your disaster planning efforts will have been a complete waste of time. Oh darn, we never had a disaster! Who could complain about that?